and me with my neato socks. Note: I began writing this review the day after the race (February 24). However, this never-ending winter has sucked every ounce of motivation out of me and, even though it is raining today, at least it's kinda warm and it's the first day I feel like maybe Spring will actually arrive before July. After weeks and months of running in the cold, snowy, windy, yucky weather, I decided to head south and try my luck in warmer climes. With only four weeks between the two events, I hashed out a training plan that gave me a bit of a step back week for recovery, followed by an 11 mile long run the next week, then another step back week before the final taper before race day. I made it through the first two weeks, but honestly, after too many weeks of cold weather running, and burning out on the treadmill, I did the 11 mile run and then decided I had enough. So I got down to Texas not having run for two weeks; probably not the best training regimen (but often par for the course for me). The weather in Fort Worth was beautiful, so much so that Baby H. got a bit of a sunburn one day as bad mommy forgot to apply the sunscreen. There had been some joking around that the weather might actually be cold, but I knew cold meant Texan cold, not Chiberia cold, so I was looking forward to getting out and running in nothing more than a pair of shorts and a (as in singular) shirt that had no sleeves. 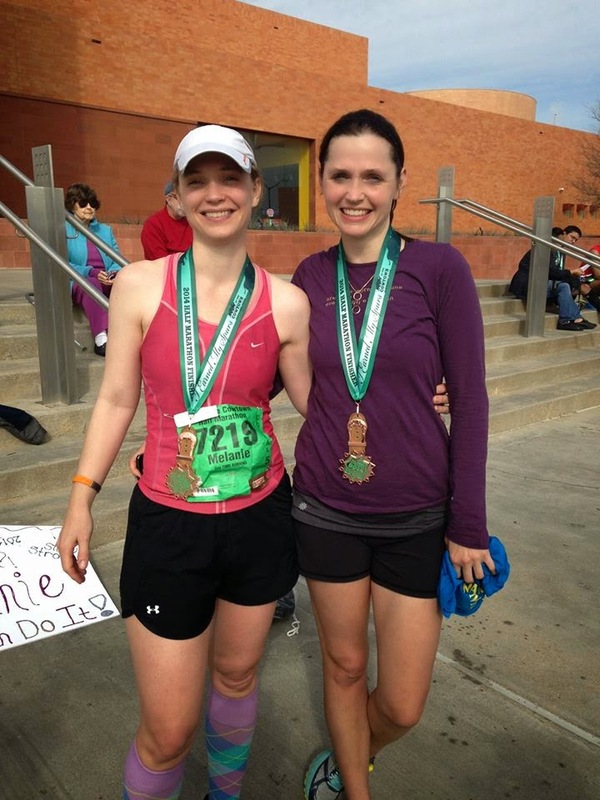 The Cowtown Half is part of a weekend full of races. They have a two different 5ks and a 10k on Saturday. And then the half, a full marathon and an ultra on Sunday. My dad and his wife ran the "adult" 5k and my aunt and cousin ran the "kids" 5k. I think the primary difference between those (other than the different start times) was the kids 5k participants got finisher medals and all proceeds went to a local children's hospital. So, Saturday morning was spent hanging out, cheering runners, and heading back into the expo to buy more running gear I probably did not need. I ran this race a few years ago, my first half, in 2011. It's a nice tour of Fort Worth, goes through the historical Stock Yards, into downtown and starts and finishes at the convention center. All three Sunday races start at the same time, and the marathon and ultra follow the same course until they turn off at about mile 11 (pretty sure I could never do a marathon when there's a half marathon option just staring me in the face - especially when you are so close to the finish line like that). Morning of the race was a little chilly, but nowhere near anything I would call cold. It was liberating to run in so little clothing (though I did add a pair of fun compression socks to the outfit bought at said expo). The race started quickly and I got into a groove pretty nicely. It was a wave start, and people seemed to seed themselves pretty well - I wasn't passing a bunch of people, nor was I getting passed a lot. There were a lot more people on this course than the previous year. It was never too crowded, but I was never really alone, which was nice. I remember before having times where there just weren't a lot of people. This year was the first year they offered a major purse for this race, so there were some fast runners and pretty much every course record was broken. Also, the Dallas Marathon back in December had been cancelled, so this race probably picked up a bunch of people because of that. The main reason I do this race is because I have family in Texas and it's a great excuse to go down to visit. My dad and his family are mostly bicyclists (in fact, my dad, uncle and brother are riding from Houston to New Orleans to raise money for the Red Cross and are accepting donations if you're so inclined), so it's fun to introduce them to the running side of the world. This being my third half, and second in such a short time, I was excited to see what I could do when I really train for something. I ran the F3 Half in 2:21:24. My goal was basically to beat that and get as close to 2:15 as I could. I figured the elements weren't going to be a problem (toward the end it started to be a little warm). I did have to battle my way up some hills (which we clearly don't have to do in Chicago). There's a big hill around mile 10, and around mile 7 I realized I was behind my pace. So for those three miles I picked it up and managed to get ahead a bit so I had some wiggle room on the hill. After the hill, and bidding farewell to the marathoners/ultras, I kept pushing my pace every half mile or so. I knew I was going to be under 2:21, maybe just barely, but under. This is really the first time that I had a plan for my time and stuck to it and actually pushed myself to achieve it. Crossing the finish line, I looked at my watch and could of swore it said 2:19 something. There's a pic of me crossing with a huge smile across my face, realizing I PR'd. I got handed the spur shaped medal (currently the coolest one in the house) and headed through the food area (which by the way is one of the great things about this race - TONS of food). I wound my way back to my family and my dad tells me that I finished in 2:16:42 (finishing 175/550 in my age group). So not only did I PR, but I really PR'd! I didn't hit that 2:15 I was hoping for, but given the hills, I will totally take it. So what's next for me? Well, now that it's almost the end of March and finally feels like maybe the weather will warm up a little, I am headed back outdoors and am ready to maintain my base. 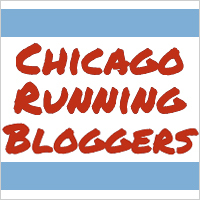 Today I signed up for the Chicago Marathon as a charity runner for the CARA Road Scholars program. I think I'm more nervous signing up this year than I was when I signed up two years ago. Probably because I know how much work goes into it. In the meantime, I'm looking forward to warmer weather (aren't we all), keeping my base up, and maybe even doing a couple of races (Ravenswood 5k, maybe another half).